Alaska resides at the top of many buckets lists, but since it also sits at the apex of North America, just getting there is an adventure in of itself. Therefore, once you arrive in the Last Frontier, you are definitely going to want to combine any adventuring with plenty of relaxing—and that’s where the Alaska Railroad comes in. This historic railway cuts through the heart of the state, doing all the hard work for you. 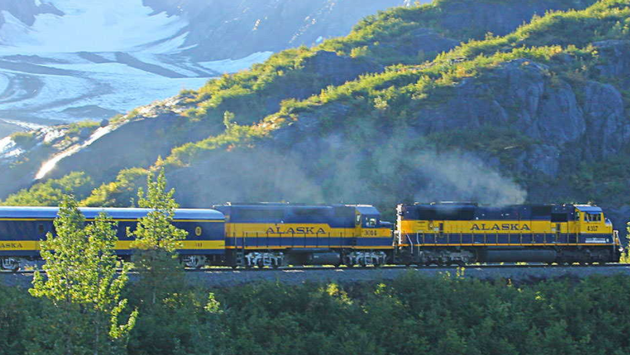 The Alaska Railroad shows off some of the most spectacular scenery Alaska has to offer while offering all riders a luxuriating experience along the way. For a few reasons, summer is the perfect time to head north for an epic adventure on the railroad. During the summer months, the state teems with life. Wildlife frolics, flora basks under the Midnight Sun and the Alaska Railroad ramps up their schedule accordingly. From mid-May to mid-September, there is a myriad of daily train options, making exploring the state a breeze. Travelers who go with their GoldStar Service get access to second-level, glass-ceiling dome cars, upper-level viewing platforms and other assorted open areas, which puts all of the blossoming beauty of the Alaskan summer right before your eyes. During this peak season, the Alaska Railroad offers every type of traveler a journey right for them. For those who just want a taste of what the Alaskan wilderness is all about in one day; the Coastal Classic is the train for you. This glorious journey begins and ends in Anchorage, with an extended stop in Seward in-between. Passengers are treated to stimulating scenes of mountains plunging into the sea as the train winds its way along the legendary Turnagain Arm into the backcountry of the Kenai Peninsula. After setting off bright-and-early, the Coastal Classic pulls into the pretty port town of Seward in the late morning, thus allowing riders the opportunity spend a few hours in Kenai Fjords National Park. Other popular excursions include wildlife and glacier cruises or treks up to a vista that offers breathtaking views of Harding Icefield. Then, cozy up on the train for the return trip to Anchorage. Intrepid travelers will want to head for the Hurricane Turn line, a railway that trundles from Talkeetna into the vast wilderness. It’s famous for its “let us know when you want the train to stop” flag stops. This means that the Hurricane Turn will essentially stop wherever you request it, opening up the entire Alaskan backcountry for independent exploration. And for those looking to dive into the wonders Denali National Park, then look no further than the Denali Star. This line runs from Fairbanks to Anchorage (and vice-versa) every day in the summer with one of the stops along the way being the famous national park. Depart the train at Denali for the adventure of a lifetime. While the landscapes outside the train may be wild, you won’t miss out on any foodie comforts aboard the Alaska Railroad. That’s because they’ve recently rolled out a focus on local ingredients, which makes the meals nearly as memorable as the panoramas. If you opt for GoldStar Service, expect to start your day with delicacies like Snowbird Barley—a twist on a classic barley cereal made with ingredients from Alaska Flour Company—before moving on to more substantial specialties like Reindeer Bolognese made with locally-sourced reindeer and Potato Crusted Alaskan Cod. Craft beer connoisseurs are catered for as well, with brews from Alaskan Brewing Company, Denali Brewing Company and Double Shovel Cider Company being poured onboard. These days, travelers crave local experiences more than ever and Alaska Railroad is acing this category with their Onboard Tour Guide Program. The program makes sure that on their trains, riders are always surrounded by local guides full of insider knowledge of the state. Yes, Alaskans will be the ones explaining the significance of the beautiful sights rolling by and you’re certain to be spellbound by their stories.